Acrylic Magnetic Frames are Perfect for Countertops! 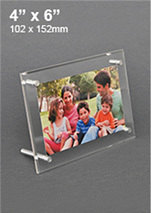 Acrylic Magnetic Frames include Landscape & Portrait Orientation Options! 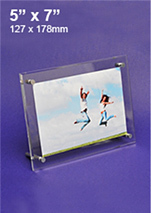 These tabletop picture frames, acrylic magnetic frames include many different styles, allowing you to easily find one that will work well for your home, office, or business. 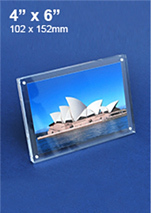 The diverse selection of promotional photo holders has many sizes and types to choose from that work well within any décor, making it an easy task to find the appropriate one for your needs. 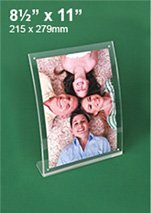 These premium tabletop picture frames are long-lasting, made of quality materials in order to ensure they will work at your location for years to come. 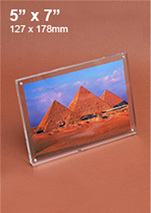 These acrylic magnetic frames have a slew of different features available that make them an easy purchase to be displayed on your desk at home or in the office, or even to place for sale at your business. 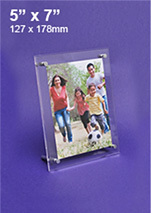 Additionally, these tabletop picture frames, also known as custom photograph holders, can be used in retail stores to display promotional posters, important banking information, product specs, menus, and so many more! 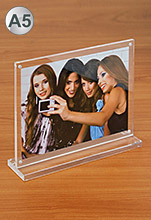 These table top photograph displays are offered at wholesale prices without compromising on quality, meaning you get a great product without enormous expense! These magnet holders are made of thick clear plastic, providing a long-lasting display that will work well within any décor for years to come. 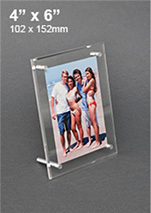 These holders utilise clear plastic in order to ensure your photographs are easily visible within the stylish holders, with many sizes of pictures able to be used. 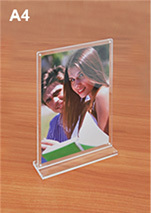 By using clear plastic, you get the visual appeal of a glass holder at a lower price, plus these stands are more durable! 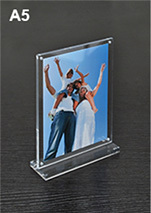 These photo displays hold many standard sizes of images, including 3-1/2" x 5", 4" x 6", 5" x 7", 8" x 10", & even sizes such as A4 (297 x 210mm) and A5 (210 x 148mm)! These sizes are the maximum that may be held in the displays, as smaller sizes can also be used to achieve a really stylish stand! 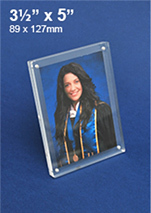 The holders are able to hold your graphics in both portrait & landscape orientations unless otherwise specified, and a counterpart is available in the opposite format if that is the case! 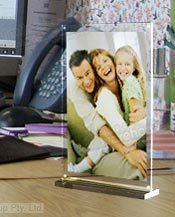 The polished edges on these displays make an impression wherever they are placed, perfect for showing of photographs of loved ones around the home or on your desk at the office! Some of the displays also feature a beveled edge to provide another captivating feature to help draw attention towards your displayed photographs, promotional posters, or more. 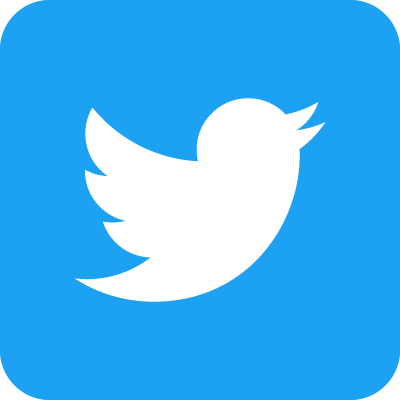 Many retail businesses also purchase these holders for use as a premium sign holder, including at casinos, exhibition halls, hotels, retail stores, banks, jewelry stores, information centres, pubs, cafes, and restaurants! 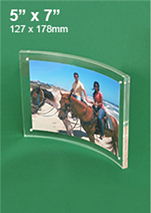 The different styles of holders include curved displays that allow you to place photographs in either the concave or convex side to give you options on how your photographs are portrayed. 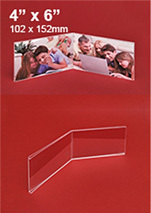 There are magnets embedded within the clear acrylic of many of these displays, helping to create a unique looking holder that makes switching out graphics an easy task. To change out posters, simple slide the two panels apart, replace your graphic in the middle, and let the sides gently come back together! This style creates a floating effect with your photographs for a stylish look that draws in passersby with ease. Many of these displays are able to be used as a single or dual-sided stand, allowing you to maximise space to show different images without taking up additional counter space. This is especially useful in retail stores where counter-space is at a premium, allowing you to have graphics displayed without taking up additional counter space. 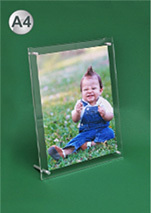 Many of the displays have button magnets embedded within the acrylic, securely holding the (2) panels together and making graphic changes very easy. 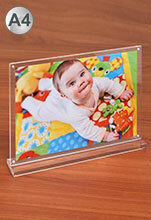 Simply slide the two panels apart from each other, put your new photograph, picture, or poster within, and let the (2) panels gently clasp back together! 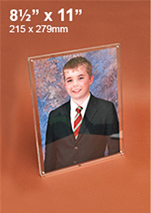 Our other styles of frames utilises stand-offs that are easily unscrewed with no tools required. Both methods require less than 1 minute to change out your photos! 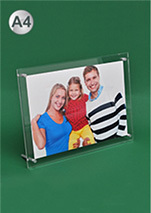 The way the photograph sits within the frame gives it a unique floating effect that is highly desirable, allowing these stands to be placed into any location, including upscale, and fit in perfectly! 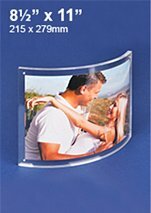 These promotional photo holders allow you to place photographs on counters, tables, & desks in a stylish fashion that calls out to passersby to view the pictures within. The wide selection of styles we offer includes different sizes in order to work well with your needs. The durable displays offer the look of glass at a lower price in order to provide a durable display that doesn't break the bank. The vast online catalogue features hundreds of products in different categories, making it easy to make a choice in how to present your promotional posters or merchandise around your business. New products are added to our selection weekly, helping you to stay ahead of the competition by utilising the latest in trends, styles, & technologies! 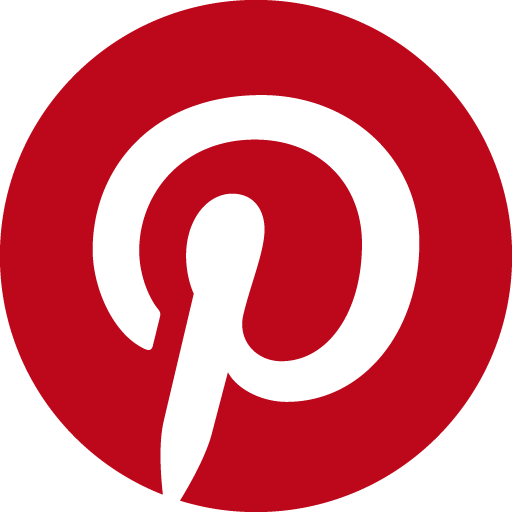 Browse our selection of POS signs, A-boards, iPad displays, cork boards, lecterns, TV stands, cafe barriers, stanchions, light boxes, stand offs, event flags, cigarette bins, window displays, pull up banners, write-on boards, easels, & more to fulfill your business needs for a low price! A leading purveyor of goods for over 20 years, Slimline Warehouse has been providing high-quality POS, POP, retail, & exhibition displays at low prices that can't be matched to Australian businesses. Our large selection of products have all been thoroughly inspected by our quality assurance team to make sure our customers only receive the best products that will last for years to come. Same day despatch is provided with most in stock products that have been purchased by 1pm EST from our warehouse to anywhere in Australia, including Sydney, Toowoomba, Newcastle, Cairns, Gold Coast, Brisbane, Darwin, Alice Springs, Perth, Adelaide, Melbourne, Hobart, Bendigo, & Canberra!